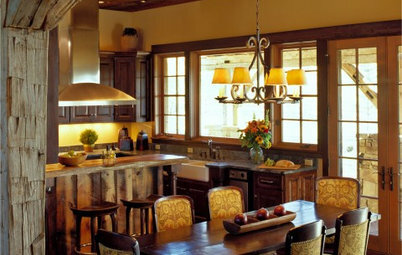 Creating rustic nuance can feel like a nitpicky process, but the payoff is huge. The right balance of features and materials evokes memories, some you can't quite put your finger on. 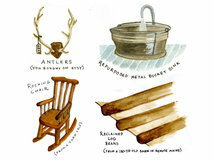 Whether the home is a simple log cabin, a farmhouse with a porch, a timber lodge in the mountains or a weathered cottage on the beach, the details will tell the story. I thought it would be fun to break it down. 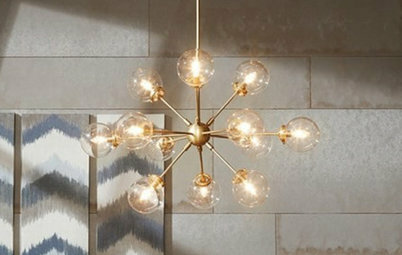 In this 10-part series, I'll show you how to combine authenticity with convenience while letting the style of your home lead the way for all the details. The final wrap-up will show how to pull all those pieces together. 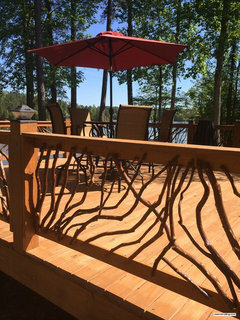 For this first part, let's examine the four basic styles of rustic structures. 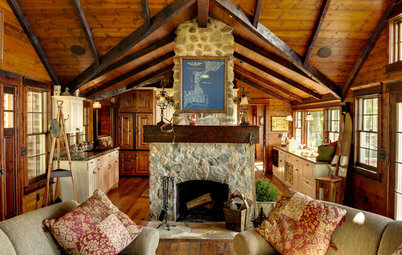 Terms like "cottage," "farmhouse," "cabin" and "lodge" mean something different to each person. 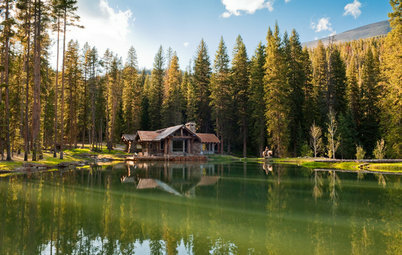 (I still have ongoing arguments with people over which is the front yard and which is the backyard of a cabin.) 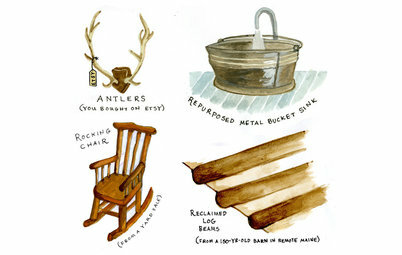 The photos and descriptions below illustrate what I mean by these terms and styles — and may help you pin down the rustic style you yearn for. 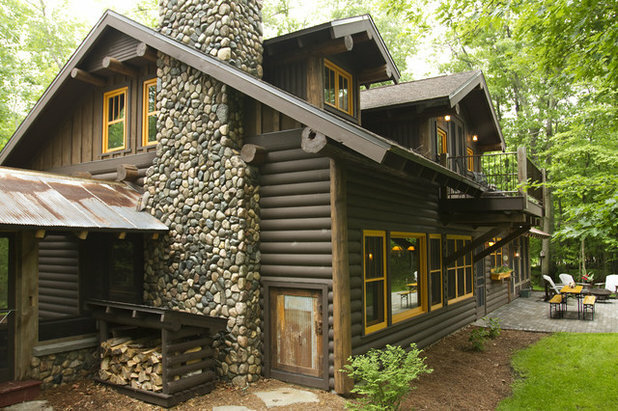 With a dark-stained log exterior and fieldstone chimney, this is the quintessential cabin. 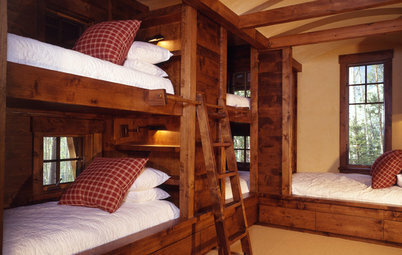 As with many homes of the past, cabins were built from material found on the surrounding land and utilized surplus industrial material purely for function. 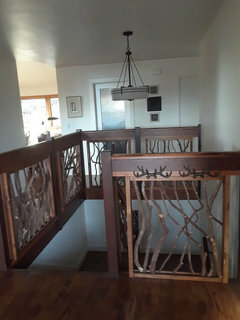 See the rusted firewood pass-through door and breezeway roof? 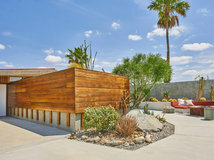 Homes that have been around for generations were often modified over the years, either with an addition or joined with other structures on the property by a connecting breezeway. 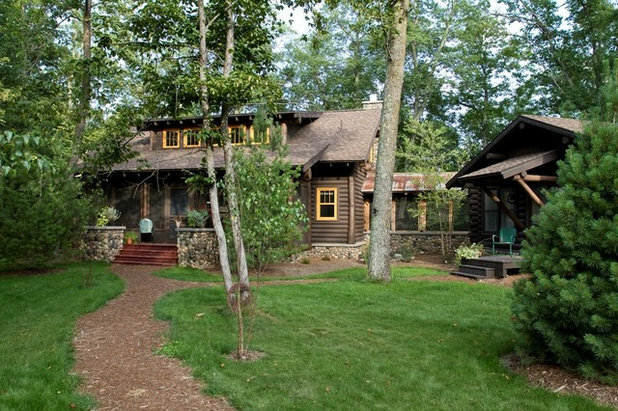 The home above is new construction, but the materials used and the positioning of the cabins re-create the past. 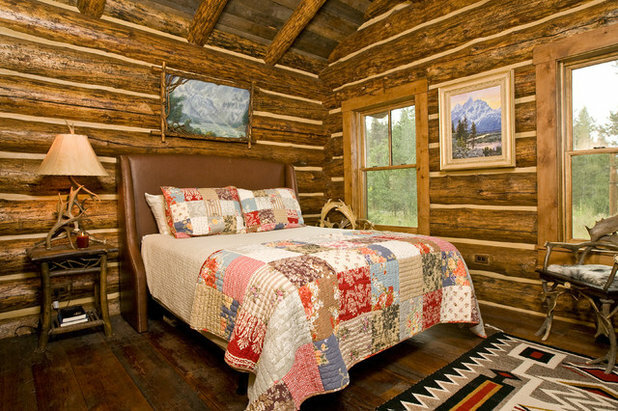 Original log homes were built by stacking notched logs. Settlers had to shape the wood themselves; they used chinking to fill gaps between irregular-size logs as well as to allow wood to expand and warp over time. Back then chinking was made of local materials, usually mud or clay mixed with straw. 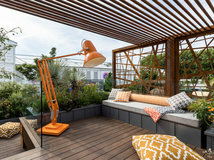 Today flexible acrylics are used, but the look can be kept true and rugged by opting for hand-hewn logs and thorough but slightly uneven chinking. As with any home style, there are several variations on cottage style, each triggering a different image in my head — all of which are small, sweet and a little romantic. 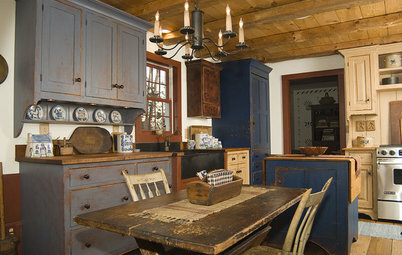 For a modern rustic cottage, let's think American beach cottage instead of Victorian cottage. 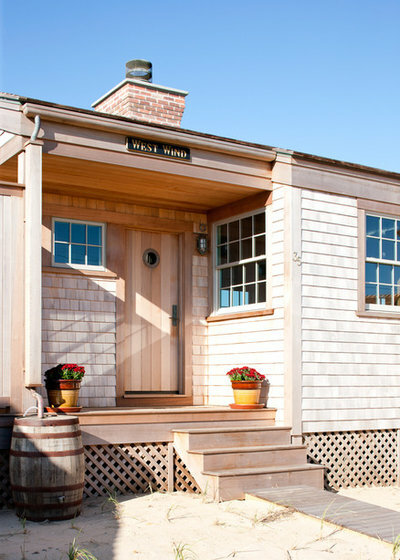 Weathered cedar shakes and white clapboard siding. Bright and airy interiors. 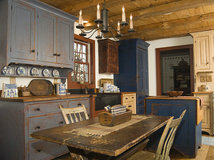 A classic characteristic of cottage style is painted wood. It shows up on floors, ceilings, walls, cabinetry. 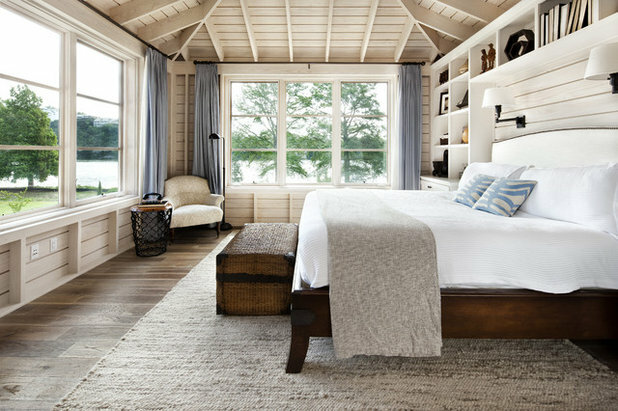 Open shelving and all-white interiors are also no strangers to the beach cottage. 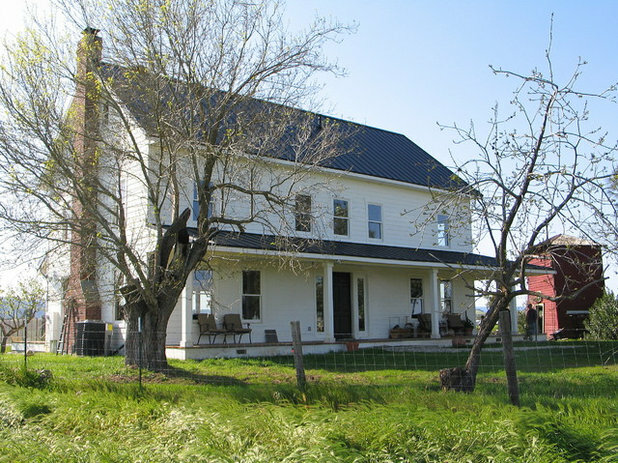 The farmhouse holds a permanent place in the rural landscape and represents hard work while promising safety and comfort. 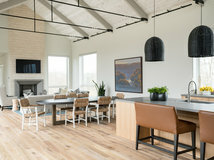 More than any other style, this type of home and the outbuildings it sits with are deeply connected to the land — white dots in the middle of a green field. Common elements are big porches on which to kick boots off; unfussy, pitched rooflines; and simple siding. 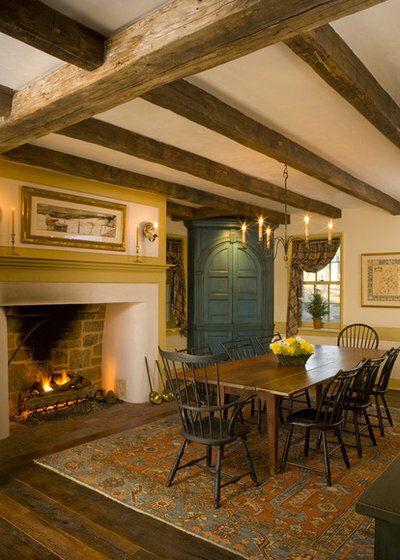 Built without lavishness or waste, farmhouses historically were constructed using material that was readily available: rough-hewn beams, a fieldstone dining room fireplace and wide plank flooring, for example. 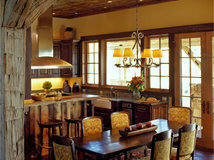 Large timber trusses, soaring ceilings, oversize fireplaces and chimneys define these homes. 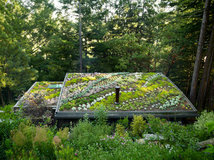 The roofing is a thick cedar or slate shingle. Think of the grand vacation homes on Lake Tahoe. The lodge is all about the view, so the windows are massive. 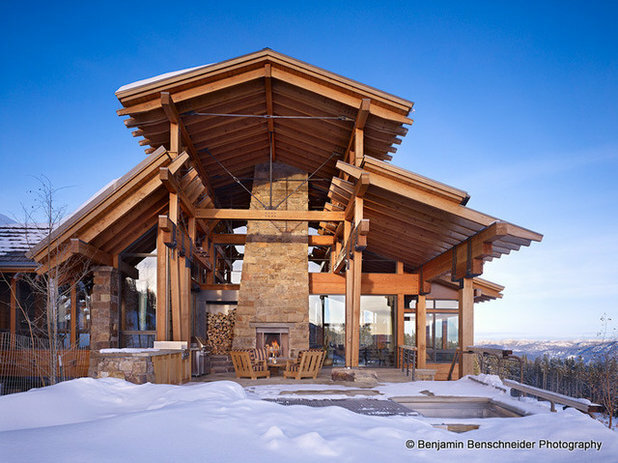 The exterior, along with the outdoor fireplace, often has a blend of materials: board and batten, vertical board and timber posts. 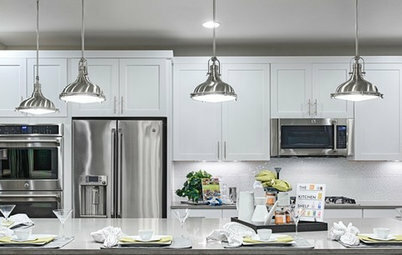 Like the rest of the details, the trim around the doors and windows is wide and substantial. 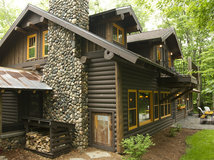 When you walk into a lodge, it is likely you will see a fireplace centered in the room, open on all four sides. Thick timbers and hefty pillars are the bones here, so industrial metal strapping and fixtures feel right at home. 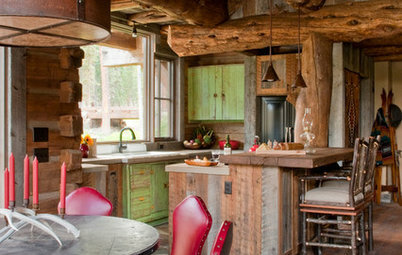 Tell us: Do you live in and love a rustic-style home? Please share a photo below! 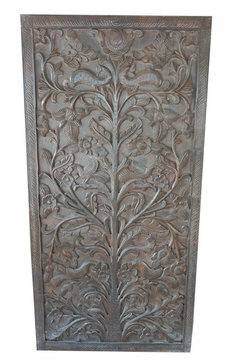 Bring the rustic luxe look with our collection of timeless antique doors salvaged from Indian Havelis. 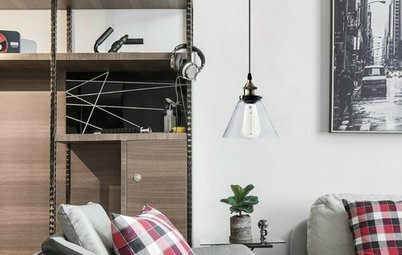 Classic kutch textiles, distressed vintage armoires and sideboards, artisan crafted furniture, accents with a hint of tribal charm: you will find everything you need to create a warm and conscious home.